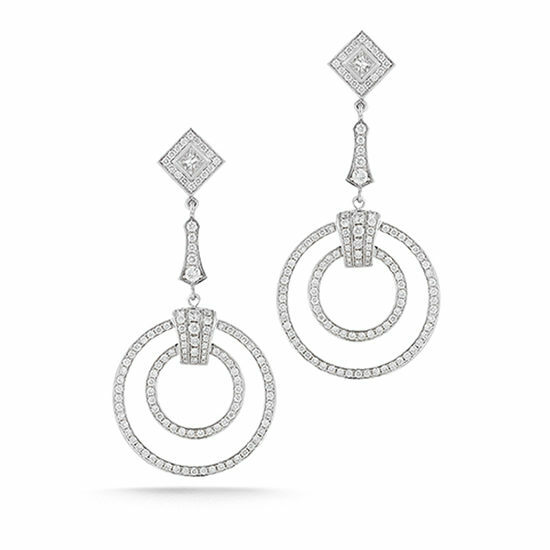 These magnificent Art Deco Diamond Drop Earrings are fully hand carved, which today is a lost art. Every section of this earring was hand carved in wax, (no cad) and then cast into metal. All of the diamonds were set by hand, by expert craftsmen, under a micro scope. Set in 18K white gold with micro pave round brilliant cut diamonds and 2 princess cut diamonds. 3.65 total carat weight. Email [email protected] or call 212-566-8977 for custom orders. Ships in 10-14 days with credit card payment and ship within 3 days of receipt of wire transfer.